Two Tours of the Emerald Isle, June 23-July 7 and July 7-21, 2019. Misty mornings, warm hospitality and history that goes back farther than any American can fathom…this is Ireland. From the ancient ruins to the wonderful music, Ireland is sure to fascinate and delight you. Many of us “Yanks” have distant ties to Ireland and if you are at all like us, have always had a desire to visit the land of our ancestors. 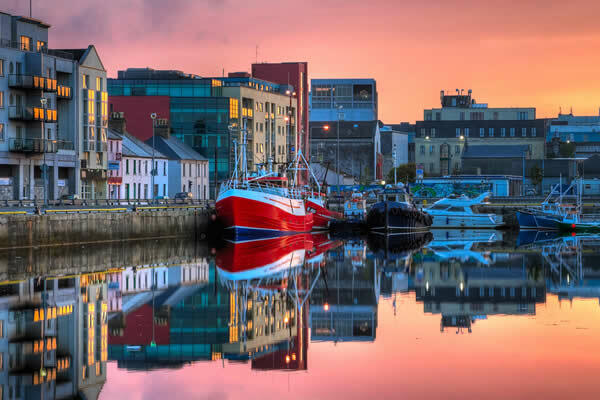 After arrival in Shannon, our tour begins in the vibrant town of Galway, where we will spend our first 2 nights. Claddagh rings, oysters and music are some of the fun specialties in Galway town, a city rich in Irish history and a bustling college town. From Galway we'll ride to the ferry that takes us to Inishmore, largest of the 3 Aran Islands, and described by National Geographic as, "one of the world's top island destinations." Lovely Inishmore makes for a nice one day stopover to see the UNESCO World Heritage site of Dun Aengus, or the Black Fort, via the coast road where we'll stop for a visit to the port village of Kilronan. We'll leave Inishmore on the noon ferry the next day, so you'll have time to shop for the famous knitwear that bears the Aran name. After arrival back on the mainland at the ferry port of Rossaveal we'll enjoy a scenic ride through the bogs in Connemara with views of the Twelve Bens range, a truly unspoiled region of Ireland. Following the coast west we pass through the seaside hamlets of Screebe and Kilkieran before arriving at Carna for the night. From Carna we pass through the charming village of Cashel before arriving at Roundstone, a picture postcard fishing village built by Scottish fishermen in the 1800’s. The village has a craft centre where you can watch the manufacture of musical instruments by traditional methods. West from Roundstone we'll pass the beautiful beaches of Dog’s Bay and Gurteen Bay on the way to Ballyconneely. Between here and our 2-night destination of Clifden is the Alcock and Brown Monument erected in honour of the first transatlantic aviators who landed their biplane in a bog after their flight from Newfoundland in 1919. Our loop ride from Clifden starts with a ride out on the aptly named Sky Road, offering superb panoramic seascapes. Next comes an exploration of the peninsula to the north of the Sky Road visiting Claddaghduff and Cleggan and the option to take the ferry across to Inishboffin. At the furthest point of the loop you can visit the Connemara National Park at Letterfrack before returning to Clifden. The town has some great music pubs, so you might want to sample the entertainment after dinner. 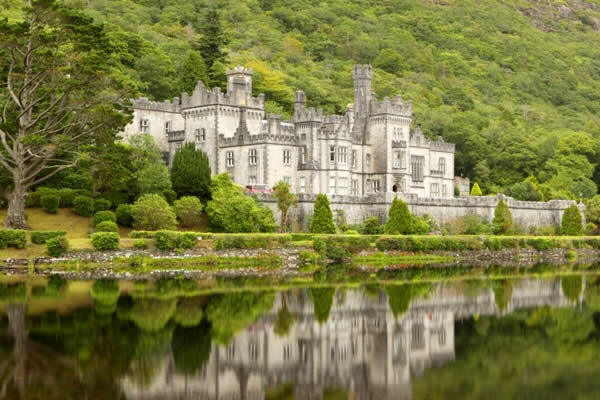 In the Lough Inagh Valley, we'll stop to visit Kylemore Abbey, one of Connemara’ s most popular attractions. From here we ride north to Tully Cross and then follow the beautiful coastline of Killary Harbour, Ireland’s only true fjord. You might like to enjoy the one hour cruise on the fjord before checking into the grand old Leenane Hotel. If a seaweed bath sounds appealing, you can take one at the hotel. 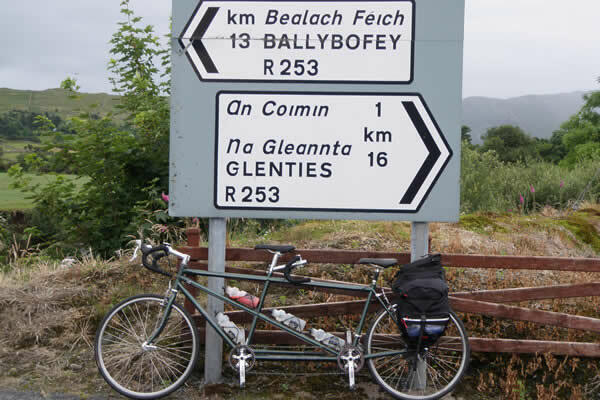 The loop ride from Leenane leads south and inland along the Maam Valley to Maam and then follows the northern shores of Lough Corrib through Cornamona to the ancient town of Cong. Cong is famous for the filming of The Quiet Man and Ashford Castle, one of Ireland’s most exclusive hotels. The return leg from Cong takes you through Clonbur and alongside Lough Nafooey before a wonderful descent drops you back into Leenane. 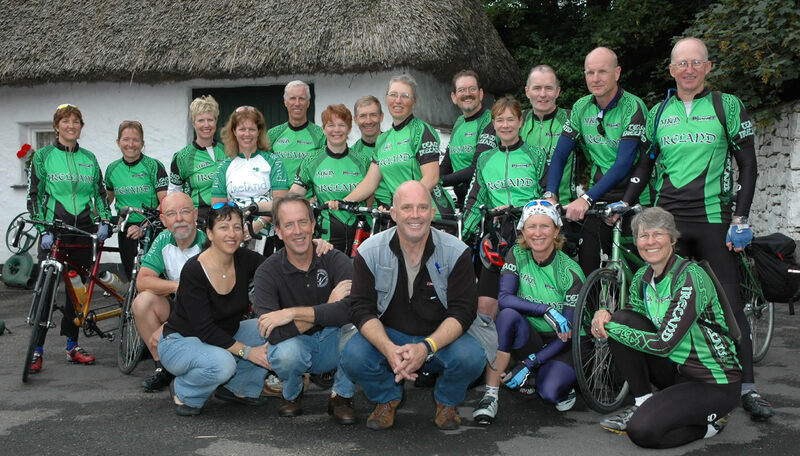 In Westport we ride south to Liscarney and then turn west to the village of Drummin. A lovely ascent into the Sheefry Hills is followed by a great downhill to Doolough (the Dark Lough). Turning north we ride to Louisburgh on the shores of Clew Bay, hideout of Grace O'Malley, Ireland’s most notorious pirate! Following the coast back to Westport, we pass the Irish National Famine Monument, the ruins of Murrisk Abbey, and the start point for the ascent of Croagh Patrick, Ireland’s holiest mountain. Legend has it that St. Patrick spent 40 days and nights at the top, and from here he banished all the snakes from Ireland! Riding north from Westport we head out along the traffic-free Great Western Greenway, the longest off-road walking and cycling trail in Ireland. The trail takes us north to the village of Newport, and then west, following the northern shore of Clew Bay to Mulranny, the location for our hotel for the next 2 nights. After lunch there is a beautiful 35km loop ride around the coastline to the west of Mulranny. Our ride to Achill Island is the scenic highlight of the whole trip. First inhabited 5,000 years ago, Achill Island is the largest of all islands off the coast of Ireland and is accessible by bridge. The island has spectacularly beautiful beaches, with Keem Bay and Keel Beach being especially breathtaking. The imprint of past generations is everywhere on the island, from megalithic tombs to ancient forts, and historic churches to prehistoric settlements. The crumbling stones of the Deserted Village are all that remains of more than 80 houses that were abandoned during the famine in 1845. 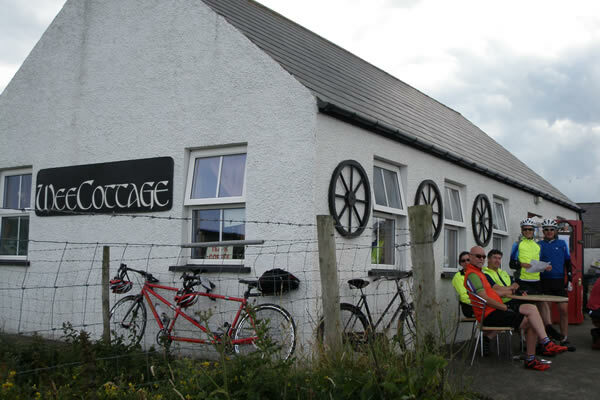 There are several options for wonderful loop rides on Achill. The Atlantic Drive is a must, and there is the option to test yourself on a climb to the Minaun Heights, rewarded by magnificent vistas across the island and the Mayo coastline beyond. Leaving Mulranny we retrace east along the Great Western Greenway for a short stretch before heading north on country lanes hugging the shores of Lough Feeagh. Here we are out in the wild expanse of County Mayo with not a house to be seen for miles in any direction! This is Ireland at its wildest and most remote! Turning east we stop for lunch in quaint Pontoon before skirting around the southern shores of Lough Conn to Foxford where you can visit the town’s famous woolen mills. Turning north we arrive in the bustling market town of Ballina, a wonderful setting in the Moy Valley with the Ox Mountains to the east and the Nephin Beg mountains to the west. The town is famous for its hospitality and its attractions include the ruins of Moyne Abbey and Rosserk Friary dating back to the 15th century along with the impressive St Muredach's Cathedral which stands imposingly on the banks of the River Moy. The river is an exceptional salmon fishery where you can watch the anglers trying out their skills in the Ridge Pool, located right in the heart of the town. For our last ride we head due west from Ballina to reach the village of Crossbarring at the northern tip of Lough Conn. Here we turn north to Bombastically, a resort town close to the Atlantic Coast and a good spot for lunch. A short distance along the coast to the west is the site of the remarkable neolithic site at Céide Fields, the oldest known stone-walled fields in the world, dating back nearly 6,000 years. On the ride back we hug the coastline, enjoying some remarkable seascapes as we approach Ballina from the north to end our tour of the west of Ireland. We hope that you will consider joining us on this tour of the West or Ireland! Please Contact Us for more information or check out our info page to see what's included on a Tandem Bicycle Tour. Besides the stunning scenery, the Southwest of Ireland is renowned for its archaeological treasures, the hospitality and warmth of its people, and the abundance of superb cycling routes. Centered on the beautiful town of Blarney, the region encompasses five spectacular peninsulas, each with its own unique scenery and attractions. 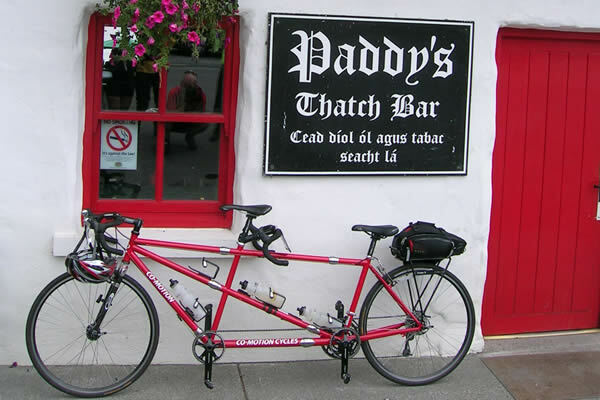 After arrival in Dublin, we shuttle you to Blarney in Country Kerry where we will assemble bikes and begin our tandem adventure. To the west of Blarney, the beauty of the Ring of Kerry coastline on the Rivera Peninsula is legendary. To the south, Bears is another wonderfully rugged and beautiful peninsula stretching out into the Atlantic Ocean. Sheep's Head, the smallest and least visited of the peninsulas, has a quiet charm all of its own. Further south Mizen Head at the extremity of the Mizen Peninsula is the most southerly point on the Irish mainland. North of Rivera, the Dingle Peninsula has sublime coastal scenery and some of Ireland’s most fascinating antiquities. 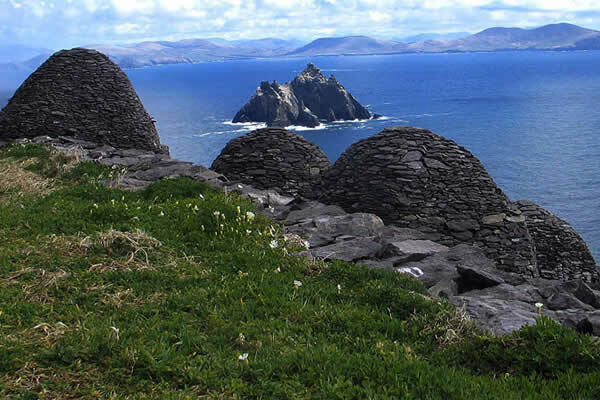 The Skelligs and the Blaskets are the best known of the region’s offshore islands. The Rides: Starting with a two-night stop in Killarney, we next ride east to Gougane Barra, and then south to meet the coast at Bantry. Using this as a base for two nights we explore the remote Sheep's Head Peninsula, before following the coast north to the Beara Peninsula. The spectacular Healey Pass takes us through the Caha Mountains to Kenmare for another 2-night stop. The Ring of Kerry occupies the next 3 days, with the option to visit Skellig Michael by boat. We'll then explore the wonderful Dingle Peninsula, and our tour concludes in the colorful town of Tralee. This is a 14-night tour with departure for home on Sunday, Jul 21. Tour Price: $4350 per person. If you would like us to send you the Booking Form or would like more information, please Contact Us. For details on what's included in all Tandem Bicycle Tours, please see the specifics.